Making your own atlatl or spear thrower and darts is a satisfying experience plus it saves you money! 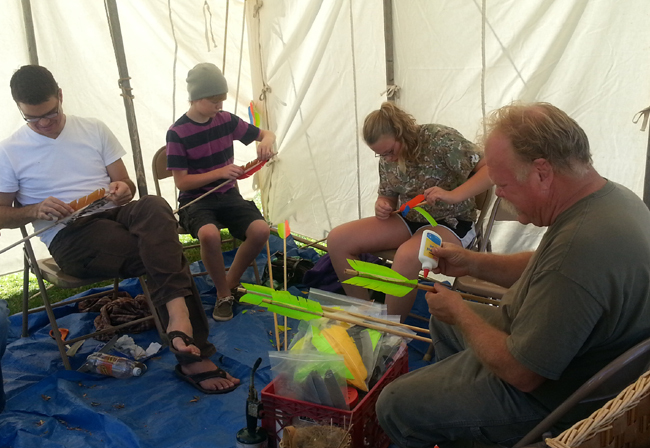 We make great atlatl and dart kits here at Thunderbird Atlatl. Our kits have been featured in Make Magazine. Now, thanks to the efforts of our webmaster and videographer Peter Berg, we have posted our atlatl kit instructions to our website. We are also uploading instructional videos on each of the kits to You Tube and posting them on our website. The first video on making your own dart kit is now available. Below is an example of a dart and a Wyalusing atlatl made by one of our customers. The second picture shows participants in one of our workshops making their own darts. This workshop takes place every year at the Chimney Point Historic Site in Vergennes, VT.
Wyalusing Atlatl and dart made by William Moss.